Years ago I was sitting on the bank of mother Ganga. It was around noon time in the summer. I prayed for some experience, or some lesson that could help transform my life. In the Bible it is said, “Seek and you shall find.” So while I was sitting on the banks of Mother Ganga that day, and I was really seeking, then something happened. I was all alone, because it was summer, and it was at Prayag. A hawk, a very big hawk is flying just over my head, its wings were spread – brown, gold, white – it was coming lower and lower until it was just a few meters above me. I looked up, and his sharp claws were moving like it was about to attack someone; its yellow eyes glistening in the sunshine were staring upon… what appeared to be on me; and there was no one else around. Its beak was curved and sharp at the tip as it came just a few feet above my head. Then suddenly it went head first into the water, underwater. While underwater there was a skirmish with splashes and splashes and splashes. 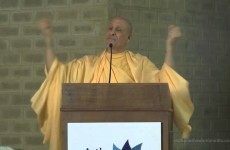 I was wondering, ‘What’s happening?’ Suddenly the hawk emerged from the current of Ganga and in its claws was the fish. Now this was just a few feet in front of me. That fish was about a foot long and I could see its eyes. I don’t know if it was a boy or girl actually, but I could see his eyes. They were completely disoriented, shocked. As the hawk was bringing the fish higher and higher, the fish was flapping furiously trying to escape, but could not. And yoga means to integrate, to unite, the true-most meaningful purpose in life in everything we do, whatever we think and whatever we speak. As I saw that hawk carrying the fish into the forest, I was thinking, “If this fish was swimming deeper, the hawk could not touch it. Krishna tells in Bhagavad-Gita that true intelligence is when we rejoice within, when we find our happiness, our shelter, within. If we find there, we find such treasure of love, naturally we become instruments of the compassion of that grace and we want to share it with the world. Without that experience, birth after birth we are struggling and striving to find things outside of ourselves to give that experience. If the building has a strong foundation, no storm, no wind can knock it down. But even if you build an incredibly ornate palace on shifting sands, then when the storm comes, everything will crumble. in the world. These trees have gone through thousands of years, some of them, and have endured earthquakes, blizzards, storms, and tornadoes. How do they just keep growing and growing? Because the roots of the redwood trees, underground they reach outward for the roots of other trees. And there, as soon as two trees connect with each other, they wrap around, intertwine, and make a permanent bond. Every tree in the forest directly or indirectly is supporting every other tree, and therefore even through sunny days and stormy days they just keep growing higher and higher and get stronger and stronger. When I saw this, I was thinking, ‘This is what satsangha is. 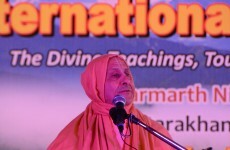 Satsangha is when people come together, like we are here at this international yoga festival, with the divine purpose. There’s a beautiful story in the Srimad Bhagavatam about a very young boy who was confronted with the most incredibly difficult challenge. 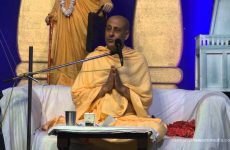 When we serve mahats, great people, our taste, our eagerness for transcendental life increases, and we want to hear these spiritual subject matters, Hari Katha. One day, he had so much faith in these people, he asked them, “Could I take the remnants of your food after you finish and leave it on your plate?” And they gave this permission. And because he served them and they blessed him so much, he had such faith in the food, that just by eating it he was transformed. He started to understand everything they were speaking, such deep wisdom. After some time they all left. He was left alone with his mother. The five-year-old child, the mother; all of her affection was for him only. She was widow; she had nothing else and he had no other protection. Then one night she went out to take care of a cow and a serpent struck her on the leg and she died. Now this is a turbulent situation in a child’s life, five years old: you’re all alone, your mother who protected you in every way from the time of your birth is dead. 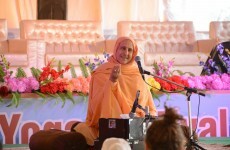 Naturally he felt in his heart separation from his beloved mother, but because he heard transcendental knowledge from these great sages and he received blessings, he was thinking, “This is the grace of God. It is an opportunity for me to come closer.” He began to travel. He traveled to the great towns and cities and saw how people were living and what they were doing. He was always looking for deeper wisdom, for a deeper connection to God. He went to the villages, into the agricultural fields, and soon he found himself deep into a forest where no humans would ever go. He was thirsty, he drank water from a little pond and then he sat under a Banyan tree and meditated. He did the same exact meditation he learned from those great sages and Rishis. He was meditating on the Parmatma within his heart. And by divine grace, Parmatma, the Supreme Personality of Godhead, appeared within his heart: the essence and source of all purity, of all love. The little boy in his meditation was in ecstasy. He described to Vedavyas in Badrikashram, “I was swimming, I was drowning in an ocean of ananda or ecstasy.” He was so grateful. Suddenly that form disappeared; he came out of his meditation. He felt such a deep connection; he wanted to make it again. He did the same exact meditation again and again and again, but nothing happened. He was yearning, he was longing, and then Bhagavan spoke to him from within. He said, “My dear child, I appeared before you because of your sincerity, but you cannot see me like that constantly unless you are free of any tinge of material desires or attachments. So now you will not see me again in this lifetime, but because you will always be longing for me, seeking me and performing your meditation and chanting my name and glory constantly, you will become completely purified and in your next life you will be my great, great devotee.” From that time on the little boy, for the rest of his life, was meditating upon and chanting the holy names and glories of that personality, Paramatma. And he described to Vedavyas: just like when there is lightning, immediately there’s illumination; in the same way, when the time of his death came – death is like lightning, everything is finished, but at the same time illumination, light – he was totally enlightened and he revived his original, pure consciousness, and he became Narada Muni, the sage who is constantly playing his vina and chanting the glories of the Lord. He became the Guru of Dhruva, Prahalad, Valmiki, the Prachetas, and so many other great Mahajans and personalities. This is how the power of satsang transformed a young boy in such a way, that from a disaster, the death of his mother, he was able to see the door open to the highest perfection. I’d like to conclude by sharing with you a personal relationship I had, because these are not just historical narrations; these lessons can be assimilated and experienced by all of us even today. 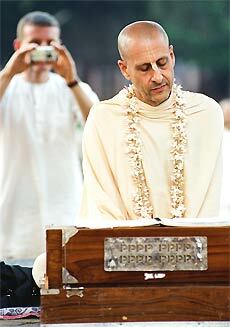 One of my very dearest friends, his name was Bhakti Tirtha Swami. He was an African-American boy, born in the ghettos of Cleveland around 1950, at a time in America when if you had African-American descent, skin was dark, there were no civil rights. If you are born in ghetto, you will die in the ghetto, 99%. There was so much violence where he grew up, but his mother always taught him spiritual principles. She was a Christian, a very openhearted universal Christian, and therefore he always was looking for God’s grace and he was always positive. He could’ve become a gangster like all of his friends, but he got a scholarship to Princeton University. He became a civil rights leader; he met Martin Luther King. 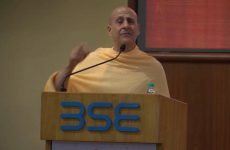 He realized, “If I really want to make a substantial deep change – as Gandhi said – I have to change myself, and that needs to be spiritual.” He came in contact with the same Guru that I have, His Divine Grace A.C. Bhaktivedanta Swami Prabhupada who taught a timeless lineage of bhakti yoga, the Brahma-Madhva-Gaudya Sampradaya. He became so enthused and empowered over the years, he became a mentor for Nelson Mandela, Mohammed Ali, Alice Coltrane and he wrote about a dozen books. He was traveling around the world, he had tens and thousands of people who loved him and followed him. He was struck with cancer. When he was in his very last stages, he called me. He was in Pennsylvania in America and I was about six hours away. He called me and he said, “The doctor told me I have three more days to live. I really want to see you.” So I left whatever I was doing and I drove with some others, and I was at his bedside. I had a very, very busy summer; I had meetings and I had lectures and I had conferences and so many things. After staying the day, two days with him, I went to his bed to say goodbye, to give him my last love and respects. But before I could say anything, he spoke, he said, “I want to die in your arms, stay with me.” So I thought he only had a day or two to live; so I canceled everything for a day or two, and said, “I’m with you as long as you live.” He lasted another eight weeks. 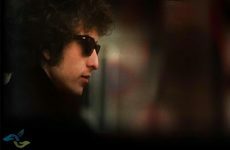 I was with him and it was incredible, because any day, we knew, he was going to die and there was… We didn’t talk about the news, there was no room for gossip or thinking about other people’s faults. 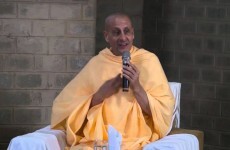 We made a vow between each other: we will only discuss those things which are meant for the ultimate enlightenment and liberation of the soul to bring us closer to Krishna. Bhagavad-Gita tells that the mind and the senses, even on a nice peaceful day could be very turbulent, what to speak on turbulent times. But we can find real peace, real satisfaction, real love, real compassion within our hearts when we experience our true, our true nature, our true self, when we feel God’s eternal love for the soul and we reciprocate by our kindness to all others. In this way we can find the highest equanimity, both in the sunny and rainy days.